One downside of the “Today” show’s fancy new rotating anchor platform that lets the anchor team be situated in front of the rest of the studio is that the background remains a working TV studio. During this morning’s broadcast, the show took a one shot on anchor Matt Lauer, who is back in New York City after missing the debut of the new Studio 1A to cover the Colorado flooding. 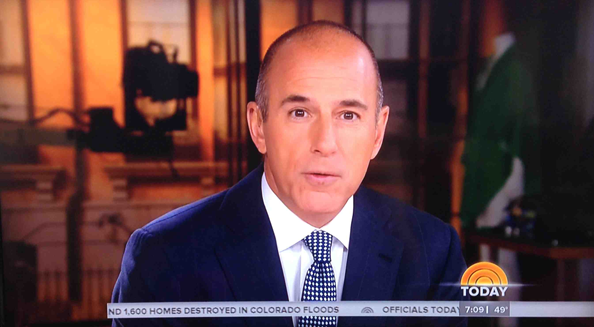 In the background, directly behind one of Lauer’s shoulders, a jib is visible. Since the background behind the anchor desk, when it’s rotated into this position allows for a sweeping view of almost the entire studio, this could become a more common sight on the show — though it could also be a purposeful move on the part of NBC News to give viewers a glimpse into the behind the scenes workings of Studio 1A. The studio’s warmer and more dramatic lighting also meant that the jib wasn’t glaringly obvious when it showed up on screen. Also in the background, to the other side, some props for a later segment were visible, though also cloaked in shadows. Later in the broadcast, it appears that the jib can be stored behind a freestanding panel at the far end of the production area that sticks out at an approximately 45 degree angle. The panel also appears to cover the two large doors that allow access to the backstage storage area.